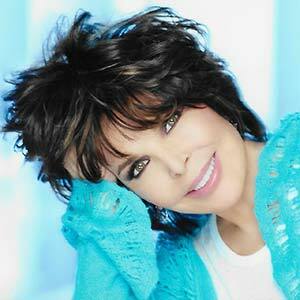 Carole Bayer Sager is a lyricist, singer, and songwriter; her songs have been recorded by such artists as Barbra Streisand, Michael Jackson, Frank Sinatra, Whitney Houston, Ray Charles, Dolly Parton, Aretha Franklin, Bette Midler, Celine Dion, and Reba McEntire, among others. This narrative is excerpted from an interview with the National Museum of American History, September 28, 2017. To me, my mother was bigger than life. She was sort of a combination of Gypsy [Rose Lee], from the musical Gypsy, and Auntie Mame, from that musical. My early life was very informed by musicals because I grew up in New York City and my mom was a fan of musical theater, as was my dad. I think the first musical they ever took me to see was [The] Pajama Game. 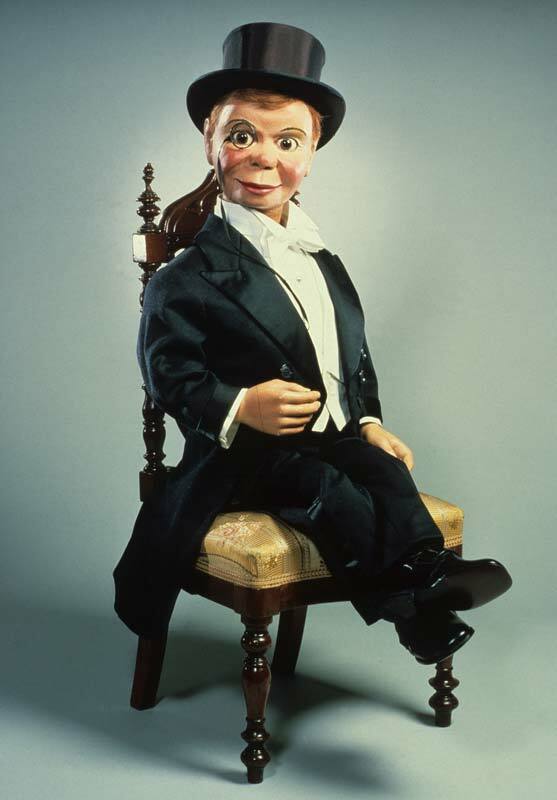 Charlie McCarthy and his human, the ventriloquist Edgar Bergen, got their start on radio in 1936, then had success in other media through the 1970s. But I was a very frightened child. I mean, just about everything frightened me. I think some of it was a result of my mom, who I love, because I wouldn’t be here today and be who I am were it not for her, being who she was. Aside from being a loving mother, she was a critical mother. To my father, there was nothing I could do that didn’t please him, and he just saw sunshine when he saw me. But he was the more passive parent and hid behind the newspaper if my mother was in a rage. When I was very small, I had a ventriloquist act. My parents used to ask me to perform for their friends when we stayed in the Beach Colony in Rockaway, Long Island, and Far Rockaway. I would happily pick up my Charlie McCarthy dummy and perform. Even then, the dummy was saying things for me that I couldn’t say for myself. I think that was the extension into writing songs and having other people sing them, because the songs could say things for me that I might not say directly. And so songwriting, in many ways, saved my life because it gave me a life. When I was writing, everything was okay with the world. There was no fear; it was the one lane that was left completely free. I always felt better when I was expressing myself. It started with the Charlie McCarthy doll, then it went to poems, then it went to songs. 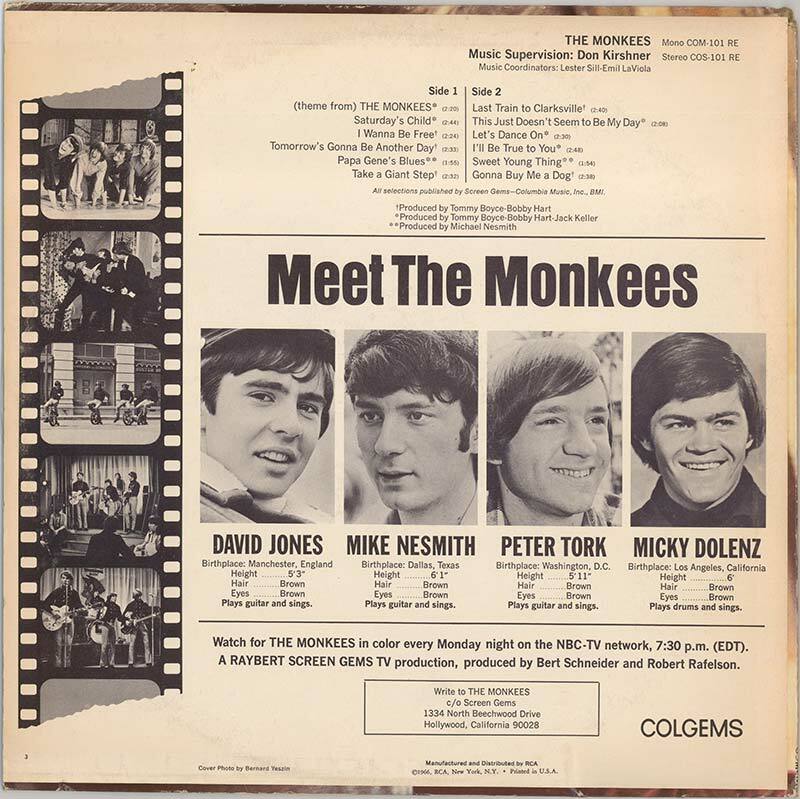 The Monkees, seen on the back of this 1966 record cover, were formed as a fictitious television band, but became one of the most successful pop music groups of the 1960s. When I was in high school, I had this wonderful friend, Sherry Harway, and we liked to write songs. So she’d come back to my house to do homework, and then we’d go to the piano, and we’d try and write these songs. They were pretty dismal attempts, in my first year of high school, but at the time, in the ’60s, there weren’t many young girls writing their own songs and singing them. We were sort of a novelty. And so, my piano teacher introduced us to two publishers who just loved that we were so young and doing this music. So, this was my passion. I knew it right away. My dad died when I was 20. So, as soon as I could, I started to help support my mother. I taught for one year as a substitute teacher, and then my songs were suddenly kind of happening. And it was like, wait a minute; I’m getting $5,200 a year to punch in at quarter to 9:00, and leave at 4:00. And then one day I got this check in the mail for $65,000 — for having the B-side of a song on the first Monkees album. I knew the inequity of that. So, I then went to a few publishers to see if they knew people I could write with, and I ended up going to Screen Gems, which was a division of Columbia Pictures at the time. It had just bought Aldon Music, which was owned by Donny Kirshner and Al Nevins. They had so many of my idols signed to them. They had Carole King and Gerry Goffin, Barry Mann and Cynthia Weil, Neil Sedaka and Howie Greenfield. Hits were just coming out of their rooms. When they liked my songs enough to sign me, they put me with a young girl named Toni Wine who was already a professional background singer and doing commercials. The first thing we did when we got together was “A Groovy Kind of Love.” It was only a few months later when they said, “Hey, this group in England has recorded your song, and they’re gonna put it out.” It went to No. 1 in England; it went to No. 1 here. And then the great thing about being a songwriter is your songs can exist forever. Twenty years later, Phil Collins re-recorded “A Groovy Kind of Love” and it went to No. 1 again in 1988 and was the most played song of the year according to BMI. 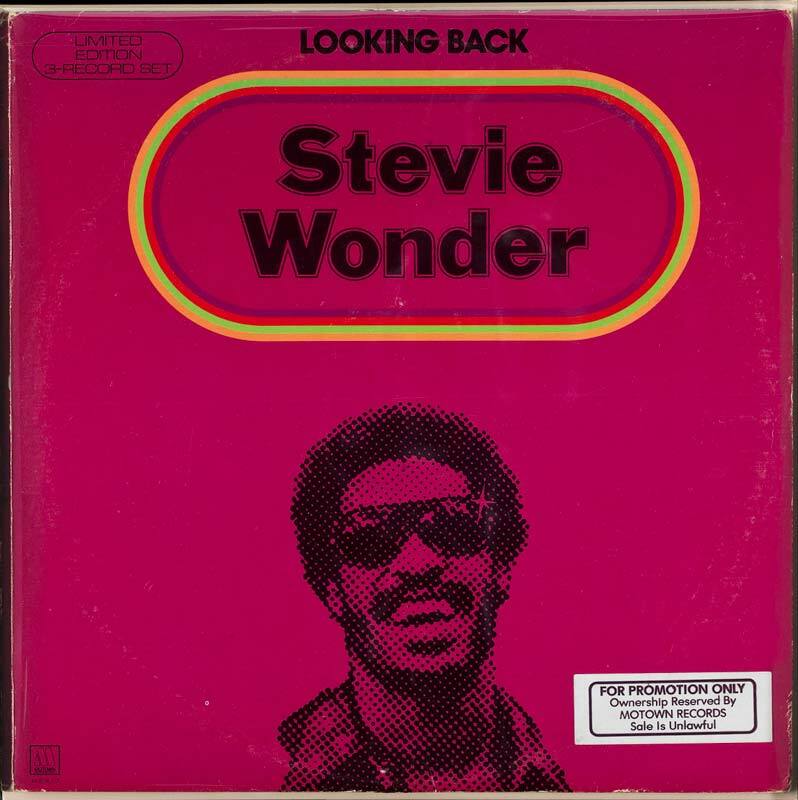 This triple LP anthology of Stevie Wonder songs from 1962 to 1971 includes 40 songs, 24 of which were Billboard hits. Later in my career, women would come to Melissa [Manchester] and me and say, “Your song, ‘Home to Myself,’ got me through a terrible breakup.” Music makes you smile. Music shifts you from a sad place to a hopeful place. I mean, when I say that I lived with my Carole King and James Taylor album, I mean it. There was a year after my first marriage where the first thing I would put on every morning was Stevie Wonder, “For Once in My Life.” And that just made me feel, Okay, I’ll go out and try again today. I tend to love to collaborate. It’s just my nature. I like to say, “What do you think of that? Did you like that line?” And I want you to be honest enough to say, “You could do a little better than that. That sounds a little like I’ve heard it before.” Then I can say, “Well, do you mind if I just play this one thing I’m hearing over here?” And you wouldn’t mind that, because maybe you’d like it. That’s my favorite form of collaboration. Collaborating with Neil Simon and Marvin Hamlisch on the Broadway musical They’re Playing our Song was a fun, wonderful experience. If Neil didn’t like a song, Marvin and I would go home and write another song. When we were in tryouts, if a joke of his didn’t work, Marvin would go home and come back with a joke that would stop the audience. Everything was filtered through Neil’s kind of comic genius. The only collaborator that didn’t want any input from me on a melody was Burt Bacharach, who also became my husband in 1981. Together we won an Oscar for “Arthur’s Theme,” a Grammy for “That’s What Friends Are For,” and then our son, Cristopher Elton Bacharach, was born in 1985. He said, “You’re a tree person. Every song is your child. You water it. You watch it. You make sure that it’s recorded properly. You call the radio station to ask them to keep it on. I can’t spend that much time on any one thing.” And it was, to me, such a wonderful way of explaining the difference between an executive and an artist. One of the songs that matters most to me I wrote with David Foster. We made the record with Celine Dion and Andrea Bocelli, and the song was for a movie where a mother would sing about her little girl going off into the big world of battle and adventure. So, it was a prayer for safety, and it was called “The Prayer.” That song is one of the few that is played not only at weddings but at funerals, along with “Wind Beneath My Wings” and “Ave Maria.” It’s a perfect marriage of the artist, the music, the lyric, and the universal desire to feel safe. Safety is what I searched for all my life, in what I perceived to be an unsafe world, and with its success I realized it is what so many others search for as well. So, it’s my favorite lyric that I’ve ever written because it’s so simple, and it can come down to a simple prayer. Bocelli was singing some of it in Italian, and Celine in English, and then many, many other artists did it again. It’s been re-recorded and re-recorded in many different countries. I believe music is a universal language. 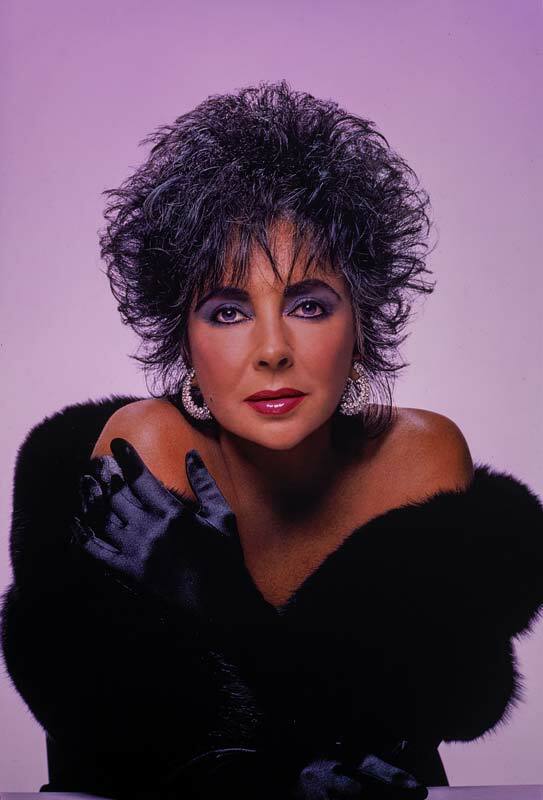 Elizabeth Taylor by Raphaële in about 1974, possibly for a jewelry advertisement. I had the privilege of being one of Elizabeth Taylor’s closest girlfriends and sharing so many of her life experiences. 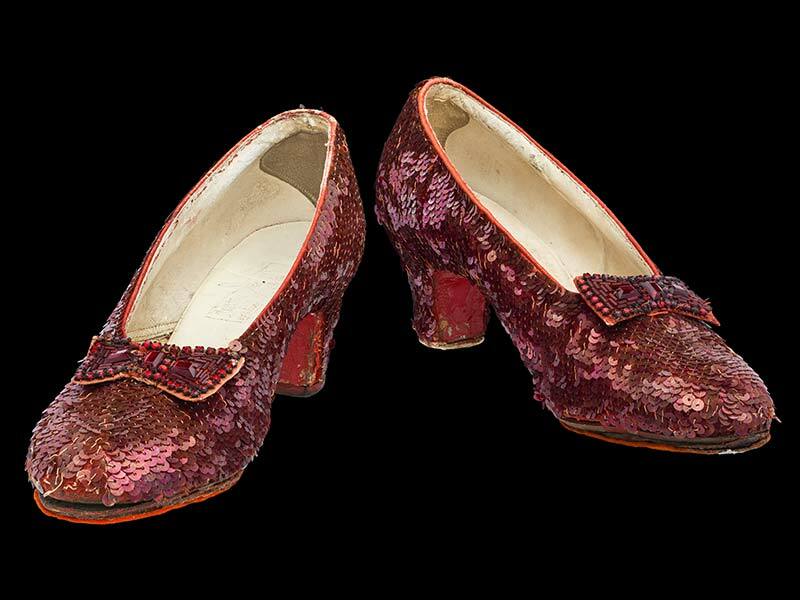 Her acting was incredible, but her generosity of heart, spirit, kindness all came through her. It’s amazing to me that our paths crossed in that way.